Sieve maida well and mix salt. Add 3 tbs of oil or 2 tbs of melted ghI to this and mix well. Add water and knead for 5 to 7 minutes as to make nice stiff dough. Keep aside covering with a wet cloth for 30 minutes. After this divide the dough into 5 equal portions. Wash potato and cut into small cubes. Grind green chillies and ginger (with or without a clove of garlic) into a coarse paste. Heat oil and add pAnch pUraN and allow it to splutter. Add the paste and sauté. Add the potato cubes and turmeric powder. Cover this with a lid after sprinkling some water. Let it cook for 10 minutes under low flame. Remove the lid and add salt after the potato is cooked well. Stir to make it a homogeneous mass. Remove from fire. After it is cooled, divide this into 10 equal parts and keep aside. Take the divided dough and roll it into an oval shape disc, as thin as a pUri disc. Cut it into halves. Apply a little water to the straight edge to wet it and convert the hemispherical disc into a conical shape using the wet edge to paste to the side. From a disc you get two cones. Hold the cone in such a way that the pasted edge faces you so that when you fill the cone, if the side opens out, you can apply some water again to wet it and paste. While filling, ensure that you do not fill to the brim but allow some gap for closing. After filling the cone with one of the divided portions of the filling, stretch carefully half of the circular portion that is open to close the other half and paste by wetting with little water. Fold the corners and paste to the sides. After filling, the shape should be an inflated triangle. Remember that the triangle after filling should not be flat but bulky on sides like a pyramid. This means that you need to fill the cone fully. Fill up all the ten cones this way and now fry them under medium flame till all the sides become crispy. The colour should be golden yellow and not deep brown. Each side requires at least a minute or two to fry. 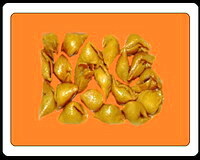 SamOSA can be taken with sauce, tamarind or pudhinA chutney. Take a lemon size of tamarind and get its thick extract by adding ½ cup of water. Add to this 1 tbs of jaggery, 4 seedless dates, ½ tsp red chilli powder and ½ tsp salt. Grind all these together. Now boil the ground mixture to make semi solid chutney. Remove. Dry roast ¼ tsp cumin seeds and ¼ tsp aniseeds, powder and add to this. Mix well. 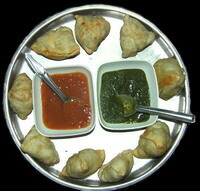 Cool before you serve with SamOSA. Take 4 tbs of pudhinA and 4 tbs of chopped coriander. Add to this 3 long green chillies with salt to taste. Make semi solid paste with a little water and mix with lemon juice before you serve. Here the outer cover is prepared as above. For filling, we take ¾ cup of khoA (khoyA), shredded pistachio (2 tbs),pre ghI fried cashew nut pieces, 1 tbs of sugar and ¼ tsp cardamom powder. We also add a few strands of saffron after mixing it well in 1 tsp milk. Mix all these and divide into 10 equal portions. Fill up the cones with this and fry in ghI mixed with oil under medium flame for a longer time than the salt variety to make it crispy. These are kept aside and then dipped in sugar syrup made out of 1½ cups of sugar and the same quantity of water. The syrup should not be too thick but should be just like the one we prepare for bUndi lADu, of a single thread consistency. If you drop a little syrup in a dish with cold water it should not dissolve but appear distinctly separate for a few seconds. Serve when cooled. If you do not get khoA (khOyA), get pure unskimmed milk with cream and boil it under low to medium flame till all the water contents is evaporated and you get the solid cream. For this on and often you need to stir so that the process is hastened. Use only non-stick deep vessel if you cannot constantly stir or deep thick bottomed vessel where you need to stir constantly so that the milk does not get charred. This entry was posted on June 5, 2011 at 11:55 pm and is filed under Miscellaneous Snacks with tags all purpose flour, ani seeds, cardamom, coriander leaves, cumin seeds, garlic, ghee, ginger, green chillies, jaggery, khoa, khoya, lemon, lime juice, maida, mint leaves, panch pooran, panch puran, plain flour, potato, pudhina, red chilli powder, refined oil, saffron, salt, Samosa, seedless dates, singara, sugar, sweet samosa, sweet singara, tamarind, turmeric powder. You can follow any responses to this entry through the RSS 2.0 feed. Both comments and pings are currently closed.